Editor’s Note: This is the third article in our series on the Uniform Laws Commission. The preceding articles were posted on Sept. 17 and August 6. They come from every state, the District of Columbia, the Commonwealth of Puerto Rico, and the United States Virgin Islands and they are the “C” in the ULC – the Commissioners! Uniform Law Commission (ULC) commissioners must be attorneys and currently qualified to practice law. They are practicing lawyers, judges, law professors, legislators, and legislative staff. They are appointed by their state or territory to “research, draft, and promote” the enactment of uniform state laws. Commissioners typically serve for specific terms and receive no salaries or fees for their time or work with the ULC, thus donating literally thousands of hours of their time and expertise each year as a public service. Each ULC state or territorial jurisdiction determines the number of its commissioners and how they are appointed; most jurisdictions specify in statute how its commissioners are appointed. In most states, the governor appoints the state’s commissioners to serve a specified term. In a few states, ULC commissioners serve at the will of the appointing authority and have no specific term. In Colorado, the Colorado Commission on Uniform State Laws (CCUSL) is created in section 2-3-601 of the Colorado Revised Statutes. The statute directs the General Assembly to appoint or reappoint six commissioners by joint resolution in odd-numbered years. Commissioners are appointed for two-year terms and must be currently licensed to practice law in Colorado. At least two of Colorado’s commissioners must be appointed from the General Assembly and at least two of the six must be from the public at large. The director of each state’s legislative legal service office, or the director’s designee, is ex officio a member of that state’s commission. In Colorado, the director of the General Assembly’s Office of Legislative Legal Services, Dan Cartin, appointed Thomas Morris, to serve in his stead. The six commissioners appointed or reappointed every other year serve on the CCUSL and with the ULC along with any Colorado citizen who is elected as a life member of the ULC (after 20 years of service). Currently Colorado has three commissioners who have been elected as life members: Thomas Grimshaw, Donald Mielke, and Charles Pike. You can find a list of past and current members of the CCUSL on its homepage. State uniform law commissioners come together as the ULC for one purpose—to study and review state laws to determine which areas of law should become more uniform. For more than a century, commissioners have, through various committees, prepared uniform law drafts and redrafts for review and approval at their annual meetings. Since its inception, the ULC has approved more than 300 uniform or model acts, of which more than 100 have been adopted by at least one state. Some have been widely adopted, including the Uniform Commercial Code, which every state has enacted. You can find a list of uniform acts that have been adopted by the Colorado General Assembly on the CCUSL homepage. The ULC considers its major asset to be its commissioners. 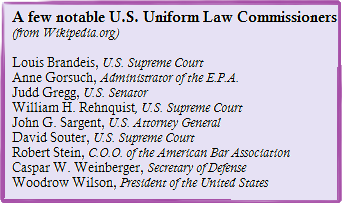 As a working organization, the approximately 400 commissioners participate in drafting specific acts; they discuss, consider, and amend drafts of other commissioners; they decide whether to recommend an act as a uniform or a model act; and they work toward enactment of ULC acts in their home jurisdictions. The procedures of the ULC are meant to promote the meticulous consideration of each uniform and model act and generally a minimum of four years is spent during the study, drafting, and adoption phases on each proposed act. The ULC can only propose uniform laws; no uniform law is effective until a state legislature enacts it. Thus, the approval of a uniform act at the annual meeting constitutes the start of the commissioners’ duties of advocating for the adoption of uniform and model acts in their home jurisdictions. Uniform laws, just like any other legislative proposal, can meet resistance, but this is considered a normal and reasonable means to foster open discussions regarding the proposal on a local level. Information about uniform acts, drafting projects, committees, meetings, and legislation is available on the ULC’s website. For information on Colorado’s ULC connection, visit the CCUSL website.